We've started to make a new feature to our blog and that will be a weekly Historic Home Highlight! Tune in on Thursday's of every week to see a historic, American home. And this week... we know you won't be disappointed. We've started things off with a bang! 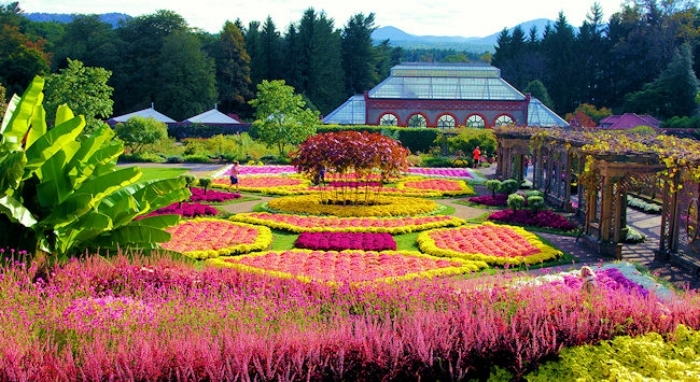 This week's home highlight is the Biltmore Estate. For those of you who are unfamiliar, the Biltmore Estate is the largest private home in the United States comprised of an eye-popping 178,926 square feet. It is located in Asheville, North Carolina and one of the most beautiful examples of the Gilded Age. The house was built by George Washington Vanderbilt II in an attempt to be closer to his mother who was residing in Asheville at the time. Vanderbilt fell in love with the climate and scenery of North Carolina and decided to build a "little" mountain escape. The home itself took nearly 7 years to build (1889 - 1896) with well over 1,000 workers and 60 stonemasons. The home consists of 4 floors, 250 rooms, 43 bathrooms, and 65 fireplaces. He even built "Biltmore Village" to house the estate employees and their families. Vanderbilt may have had bigger eyes than his pockets. After his death in 1914, much of the estate's grounds were sold to the United States government after not being able to keep up on the newly imposed income taxes. It is said that he depleted much of his inheritance on the estate. In 1930, Vanderbilt's only child, Cornelia, opens the estate to the public to generate income during the depression. During World War II, priceless works of art from the home were relocated to the National Gallery of Art in our home at Venyou, Washington, DC. Today, the estate attracts over 1 million visitors each year. It was a declared a National Historic Landmark in 1964. Oh, and it can host your wedding, corporate event, tour, or educational event!